Add a celebratory look to your wall or entrance with the Whitehall Standard Sun Poem Wall Plaque. This sculptural sign brings a welcome hint, along with wonderful shape, to your home in moments. A smiling sun in relief occupies the top of this marker, centered beneath the small arch. Next, a line from William Shakespeare reads "Love comforteth like sunshine after rain." The single line beneath this quotation may be customized with up to twelve 1.25" characters, for your name or a short message. Lightly scrolling lines on the base of the item complete the look, and three predrilled mounting holes make it simple to attach this marker to a wall. The aluminum construction and weather resistant paint combine to form a resilient and beautiful sign. 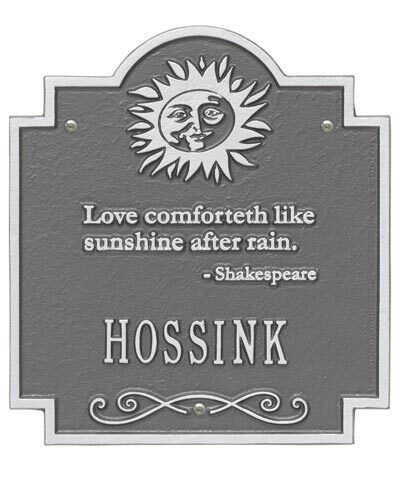 Add a dramatic element to your entry with this Standard Sun Poem Wall Plaque. Made in the USA. A pewter plaque with silver characters is pictured using the color code "PS".